Can we just talk about Cookie Butter for a second? Or, an hour. Or, maybe the whole darn day. Really, lets never stop talking about it. It deserves that much attention. Am I right? My love for Cookie Butter is very, very new. As in, I tried it for the first time a week ago. Gasp. How could I wait so long? What was I doing with my life? How was I missing out on so much deliciousness? All valid questions. Let me tell you what happened. I saw the Cookie Butter madness on Pinterest—recipes for Cookie Butter cookies, Cookie Butter pie, and even Cookie Butter bars—but, in all honesty, I just thought people were being fancy with their naming of desserts. Or, that they were listing the things they put in their desserts. Or, even that they somehow managed to take a perfectly wonderful cookie and turn it into butter, which they then baked into another cookie—I’ll admit that last one seemed a little complicated and I really didn’t want to have anything to do it. I know. I messed up. Big time. I finally decided to see what all the fuss was about. Looking at the recipes, I realized Cookie Butter was a creamy spread, much like peanut butter, that tasted like crushed up gingerbread cookies. Needless to say, I was intrigued. So, I bought a jar. Stuck the tip of my spoon into it. Took my first bite. And, then my second. And, fifth. And, then I smeared it on some bread. Ate that. And, then I proceeded to ask all my friends if they had tried this magical Cookie Butter, which most of them hadn’t. So, I of course, told them to sprint to Trader Joe’s and get some. Like now. That my friends is how I fell truly madly deeply in food love with Cookie Butter [yes, I did just hear that song, if you know what I mean]. I debated what I would bake cookie butter into first. A cookie? Cake? Pie? Bar? There were endless options and tons of ideas popping into my head (don’t worry, I will be sharing another Cookie Butter related post at some point!! 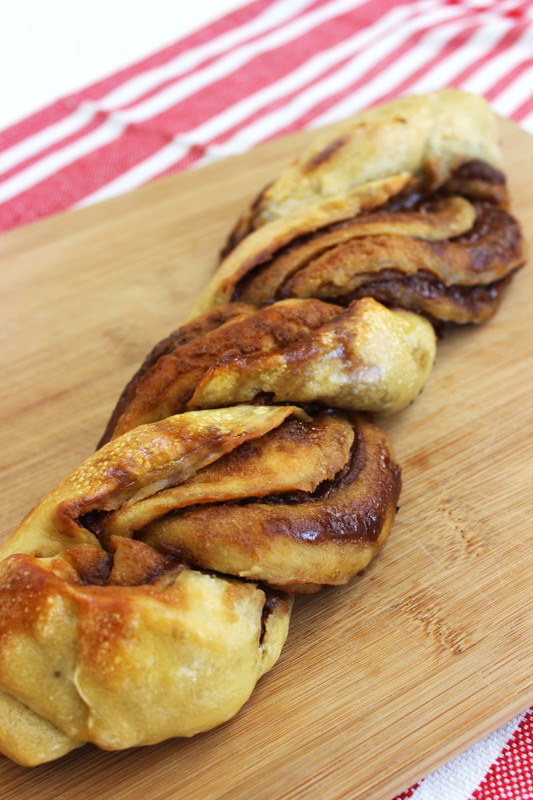 ), but then I saw this Braided Nutella Bread, and knew I had found THE recipe. Would now be a bad time to mention I also just recently tasted Nutella? Probably. That’s a story for another day. 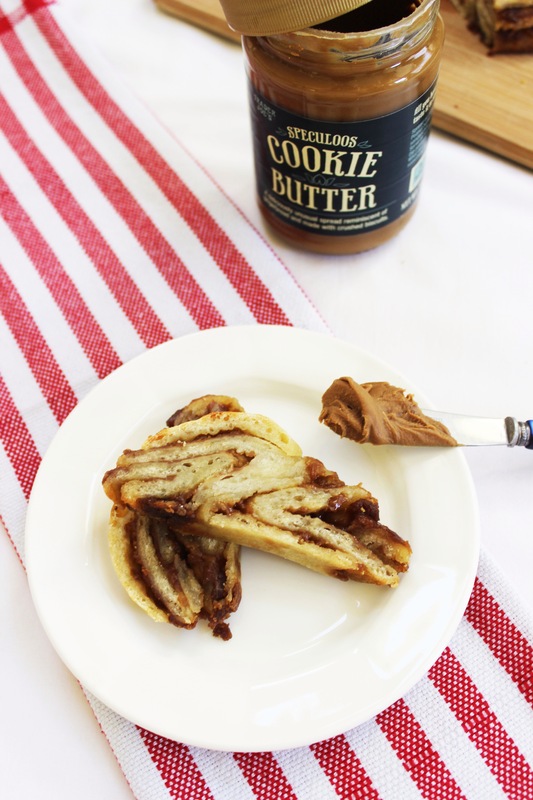 Please give a warm welcome to this Braided Cookie Butter Bread. Oh, is that chanting I hear? You guys are so kind! 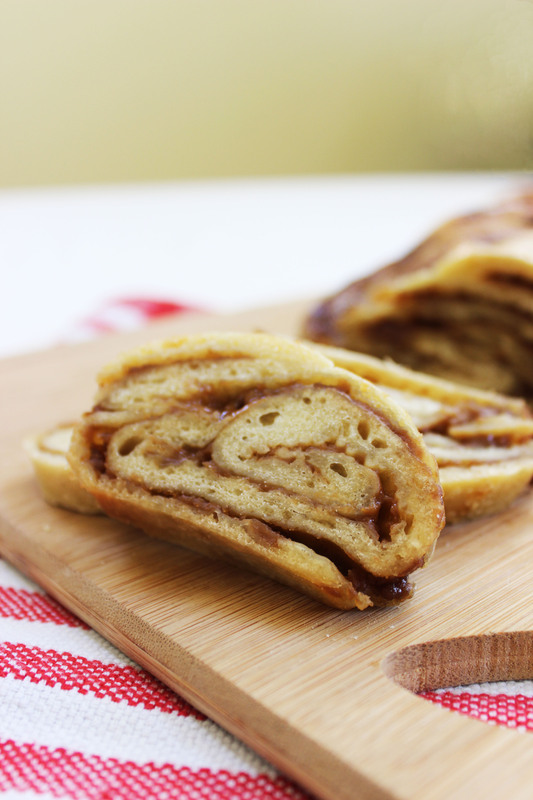 Cookie Butter swirled into a homemade bread loaf. Really, what more can I say? The Cookie Butter caramelized itself on the outside of the loaf as it bakes, giving it a little crunch, and stays creamy and soft in the inside. Honestly, I can’t say more. Just go make this bread already. In a small bowl, dissolve yeast in a ¼ cup of the water. Mix in the teaspoon of sugar and let sit for ten minutes to activate. In the bowl of a stand mixer combine flour and salt. Add the active yeast and remaining ¾ cup of water. Mix on low with the dough hook until just combined. Turn speed up to medium and mix for about 7 minutes or until dough is of a smoother looking consistency—the dough should be a little sticky, but still be able to hold it’s shape. Place dough in a lightly oiled bowl and cover the top with plastic wrap. Let sit in a warm spot for about an hour or until dough has doubled in size. On a lightly floured surface, roll out the dough to form a 12-inch x 15-inch rectangle. Spread the Cookie Butter—I found warming it in the microwave for about 10 seconds made it easier when spreading—evenly on the surface, leaving about a ½-inch border of dough. Roll the dough tightly (starting with the longer side) up. Using a sharp knife, cut the rolled dough down the middle, making sure to leave one end intact. 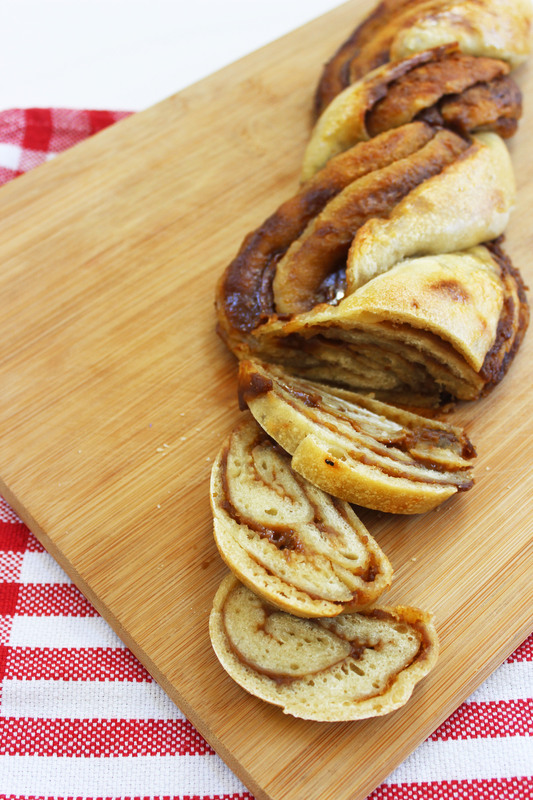 Twist or ‘braid’ the dough over the top of each other. Place braided dough on top of a parchment-lined baking sheet that has been lightly sprinkled with flour. Cover loosely with a towel and let sit for 20 minutes. Preheat oven to 350 degrees. Brush surface of the braided dough with egg wash. Bake bread for 25 to 30 minutes or until bread is lightly browned. Remove from oven and let cool slightly before digging in.